The evening before Palm Sunday, on a hill overlooking the city of Santiago, Chile, over a thousand young adults gathered for prayer with the three Taizé brothers who are at present in Santiago. The young people of Chile reacted very quickly when, a month ago, their country was struck by an earthquake and all that followed. They created networks of solidarity everywhere to bring help to those most affected. Groups of young people in zones that had not been touched accomplished many acts of generosity, sending food, and water, and giving of their time for cleaning up and beginning the rebuilding. A horizon of hope appeared where despair seemed to have carried everything away. Coming together for prayer was their way of turning towards the source of solidarity. The singing and the prayer around the cross were also a way of entering into an inner healing, to overcome the traumatisms and the fear of living in a country that is so beautiful, but marked by the earth that quakes, volcanoes, and the sea that is sometimes violent. “God has given us this land; we have to learn to live in it.” The Church, with some of its sanctuaries destroyed, has become a place to weep in, to help, to rebuild and to be rebuilt. Through prayer, it is the place where the goodness of God can be felt, always present in the midst of his people. “The Chile we can see today is not the same as a month ago. An earthquake, several minutes during which you hang on as you can, leaves you with an experience of the fragility of life that you do not forget so quickly. In Santiago itself, a metropolis of 5 million inhabitants with its astonishingly peaceful atmosphere, you realise only very little the extent of the catastrophe. Older buildings bear the marks; a series of 19th century churches collapsed. 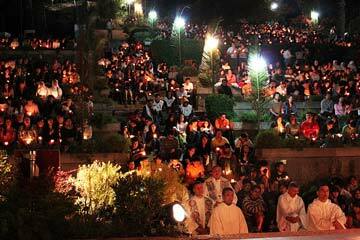 In several parishes, the Eucharist is celebrated in a hall or in the open air. However, in ’the South’, as people here say, the images are overwhelming. In the cities of Concepción, Talca and Linares, the people have lost everything. Along the coast, the tsunami has wiped out entire villages. 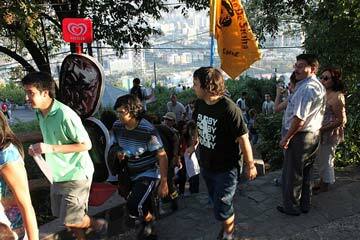 In Chile, the 16 million inhabitants all feel close to one another. The reactions of solidarity have been surprising. The day after the quake, money and food were collected. The first truck to leave for the South was loaded at La Legua, one of the poorest neighbourhoods surrounding Santiago. On the suggestion of the Cardinal, the parishes of the capital have sponsored parishes in the disaster zone. In the universities too, people are getting organised. Many students will spend the Easter vacation lending a hand where it is needed: cleaning, clearing away, and setting up prefabricated housing. Those in charge of youth ministry in the Archdiocese of Santiago spontaneously cancelled the traditional ’feast of the Resurrection’ that brings together the young people every year for the whole of Easter night at a large square in the city centre. Cancel the feast, yes. But how to avoid letting ourselves be invaded by the impression that God has somehow punished us? That he is at work and that he could be the author of this adversity? Could we not simply pray together? Rediscover an inner peace that perhaps is wavering because of the impressions of these last weeks. And face the question ourselves: how could I commit myself for those who have undergone the consequences of the earthquake in other regions of the country? Three brothers of the community are already in Chile in view of the young adults Latino American meeting that will take place in December. They were invited to lead the prayer on the evening before Palm Sunday, in a style that is a little different from what they are used to. Over a thousand young adults responded to the invitation. The place that was chosen for the prayer was more than beautiful! 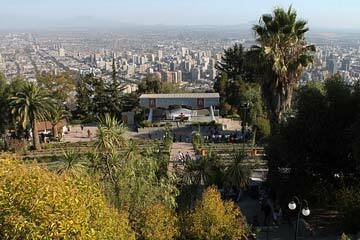 It is an open air sanctuary on a little mountain that overlooks the city centre. But you have to get there by foot; a one hour walk in the afternoon sun. 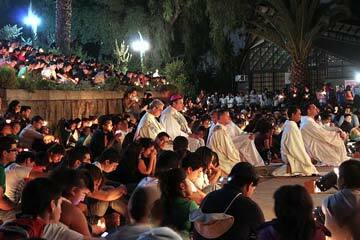 Although the songs from Taizé are well known in Chile, the prayer was new. But the young people of all ages entered easily into the silence and the meditation.